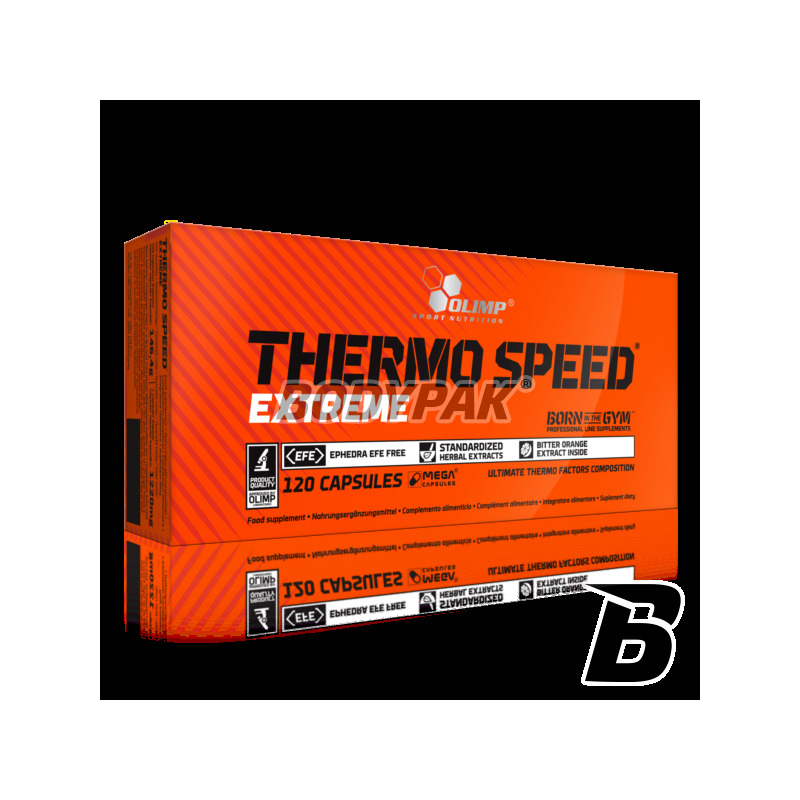 Fat LossOlimp Thermo Speed Extreme - 120 kaps. 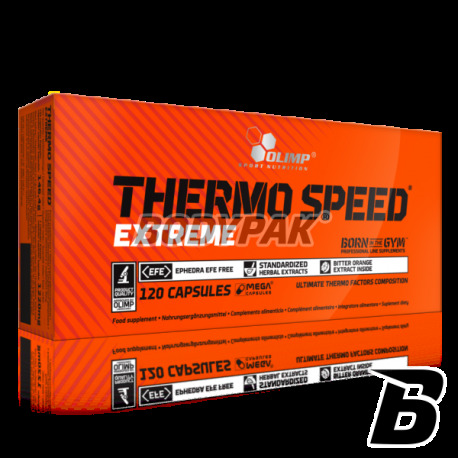 Olimp Thermo Speed ​​Xtreme - is designed scientifically complex composition of the most active thermogenic food - tyrosine, synephrine, gallate (EGCG), caffeine, and piperine. Clearly it facilitates fat loss and at the same time the development of lean muscle mass, which is shaping the perfect body definition and extreme fitness. It is designed primarily for athletes from disciplines and sculpting with weight limits as a means of supporting the work on achieving the highest form of runway and to all who wish to get rid Difficult to reduce layers of fat. During sports training, body intensifies combustion energy components for obtaining energy to generate the pulse strength of muscle fibers. Incineration is extremely powerful, because 70% percent released in its result, energy is the energy useful - used to drive life processes - and only 30% of the heat energy (thermal) - emitted outside the body. Despite the high combustion efficiency, while training and so there is an increase in body temperature, due to the overall enhancement of energy transformation. For chilling or infection, the body is forced to produce more thermal energy, or to maintain a constant body temperature, or to increase it because the higher the temperature of the internal environment of the body weakens pathogenic microorganisms, and also enhances immune cells. Then the body forces the muscles to work without a will (chills), while changing proportions between the production of thermal energy and useful. In some tissues, the production of useful energy may fall even below the 10 per cent, while the heat to rise to more than 90. Because, despite such changes proportions, the body still needs the same amount of useful energy, must burn much more energy components. This mechanism, called teromogenezą, is controlled by a number of biologically active substances, mostly of a hormone. Substances that activate thermogenesis also activate the breakdown of stored fat (lipolysis), as bogatoenergetyczny fat is the primary fuel for the thermogenesis. At the same time, most often they inhibit a protein catabolism, or even stimulate its synthesis, because it protects against wear muscle protein for energy purposes in the process of thermogenesis. Most of the substances that control thermogenesis and lipolysis, running through a common intracellular relay - cAMP. High levels of cAMP is increased thermogenesis, lipolysis and anabolism and catabolism weakened. You will notice that stimulators of cAMP can be excellent means of supporting the effort for many sports, since they facilitate both fat loss and muscle growth. The main stimulator of thermogenesis is adrenaline, which can affect the process, both directly or through raising the level of cAMP. Hormone that can not however be used in supporting the effort, because it is both a health hazard, as well as rapidly inactivated and eliminated. There are also one of the modern techniques of assisted physical effort focuses on the use of the composition of natural substances of plant origin, mutually reinforcing effects of their action, increase the level of cAMP inside cells. Formulations based on similar compositions are called termogenikami. Piperine (Bioperine ®) present in the extract of black pepper, which affects the growth of cAMP levels may be in a way that inhibits the activity of acetylcholine nicotinic acid, lowering the level of cAMP inside cells. In addition, also it stimulates receptors directly to heat, which leads to a mobilization process thermoregulatory and enhanced emission of thermal energy out of the body - as a consequence - intensive combustion and a higher consumption of spare fat. It depends on the rate at which fat is eliminated and collected spare muscle protein. Studies have shown that the most important regulator of cell elimination of fat and protein accumulation of a substance is briefly referred to as cAMP. It intensifies the fat cells of fat breakdown and its export to the muscle cells. In muscle cells while - fat burning with the release of usable energy and thermal energy and the accumulation of proteins. cAMP would be the best bodybuilding supplement, if not for the fact that it is rapidly decomposed and does not cross the biological barriers, so you can complement it, such as eating. capsules. For this reason, over the years research is aimed at identifying substances that increase the level of cAMP inside cells. These studies have shown that in this way all the ingredients work synergistically termogennego strongest fat burner which is THERMO SPEED EXTREME. Contents: 1 caps. 2 caps.